Another new writer for you. Luke Coleman is something of a scholar when it comes to the Irish Athletics scene with a great passion for the sports rich history as well as a keen eye for upcoming talent. He mixes this with a coaching schedule and still manages to train hard enough to be a very competitive runner in his own right. Yes, I’m jealous…! Here he gives us a run through of the Irish men’s marathon past and present. Since his stunning debut in Dubai becoming the first Irish man to qualify for the Olympics since 1992 (Tommy Hughes, Andy Ronan and John Treacy), Fagan has battle with injuries which have made his debut his one and only marathon finish. If he can manage to overcome these injuries there is no doubt he will be able to book his place for London. The 30 year old Belfast man is beginning his fourth year in marathon running. Since his Debut in London in 2007 (where he clocked 2.27 after suffering in the closing stages) has steadily brought down his time running 2.24.46 in 2009 and last year was the number 1 ranked marathon runner in the country clocking a solid 2.21.05. He will look this year to improve again and hopefully dip under the 2.20 mark. 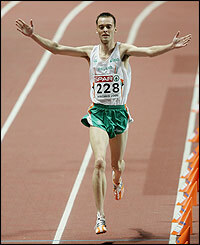 The Clonliffe man is best known for his 2009 8th place finish in the European XC in Dublin being top Irish finisher. Though he failed to translate this achievement to the track (failing to qualify for the European Championships 10,000) he has steadily been training away for the marathon and has clocked some impressive times winning a 15km race in Florida in 43.33 followed by a 4th place finish in a 20km in Holland in 59.30 equating to roughly 62-63 half marathon time. His final tune up race was the Dunboyne 4 miler where he cruised to victory in a time of 18.26 some 22 seconds ahead of the field. Kenneally will be eyeing a performance in the sub 2.14 region in preparation for London next year if he can achieve the qualifying standard. Though focusing on the track this year he saw a glimpse of his potential over the longer distances recently winning a 30km race in Holland back in February in a time of 1.34.04. What makes his time even better is the fact that he finished this run over 4 minutes ahead of the next competitor, a clear indication that there is more to come from the DSD man. All in all the marathon in this country is looking like we are in store for a rebirth of the golden era of the 80s and hopefully this will have a knock on effect to the younger generation as there are some young talented 10k runners who seeing these athletes will hope to emulate their progression.